A simple yet elegant save the date post card featuring your photo thumbnail on a hanging down tag. Here are the fonts that have been used in the post card above. Like this save the date card? You can personalize it with your own wording and details at weddingpaperdivas. Poem Script is a calligraphic script typeface designed by Argentinian type designer Alejandro Paul. Exotic, elaborate and very attractive, Poem Script was inspired from a late nineteenth century American pen script style. The typeface was designed with many variations for each letter and comes with hundreds of calligraphic ornaments. 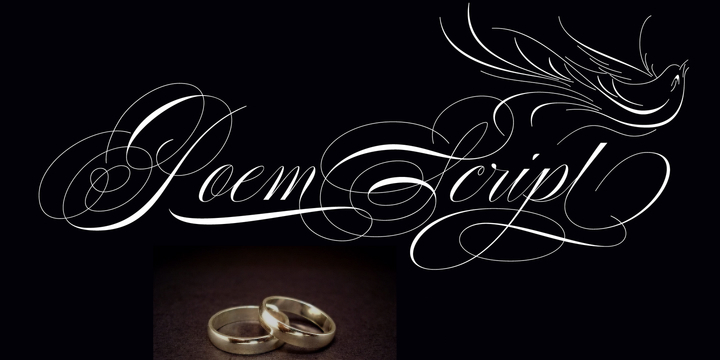 You can buy and download Poem Script at Myfonts.